After 26 years overseas — 18 in Japan and eight in the United States — The Devlins return to Scotland to live. The Devlins move to Sarasota, Florida. 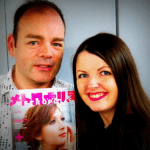 With little job opportunity in Scotland, Mark goes to Japan and initially works as an English teacher and an editor of financial reports before working as a Network Administrator for Jardine Fleming Securities. After working while at University for Ford as a management trainee, Mary joins Andersen Consulting, where she is a Strategy Consultant. On arriving in Tokyo in 1990 she works as an IT Consultant for Union Bank of Switzerland.